The controversy over hydraulic fracturing in California has been largely centered around the Monterey Formation, the rock layer that was said to be the largest oil resource in the country and almost a sure bet for a drilling boom. At least, until this week. Federal officials with the Energy Information Administration are reportedly downgrading their estimate of how much oil could be pumped out of the formation. Just a few years ago, the agency projected that oil companies could retrieve 15 billion barrels of oil. Now, it’s down to 600 million. Just to clarify: these numbers don’t reflect how much oil is underground in California. Most geologists agree that there’s still plenty down there. The EIA is attempting to estimate how much could be pumped out with current technology. As with other oil and gas reserves around the country, this number fluctuates quite a bit based on assumptions about the geology and what oil companies can accomplish. So why the uncertainty around the Monterey Shale? It has to do with the lack of information about the rock formation. The Monterey has already been incredibly productive in California. It’s been the source of most oil production in the state over the last century. The rock layer covers 1,700 square miles and can be several thousand feet thick in places. It was created millions of years ago, when dead microorganisms piled up on the bottom of an ancient sea. Conventional drilling taps into reservoirs where oil and gas has pooled underground. Unconventional drilling goes deeper into the rock layers that generate oil. That organic material created oil-bearing rock and over the millennia, oil has seeped out and pooled in underground reservoirs. Finding and tapping these reservoirs, what’s known as “conventional” oil development, has made California the third-largest oil producer in the country. These rocks are dense and historically, haven’t been very productive – until hydraulic fracturing came along. When water and sand are injected underground at high pressure, they create tiny fractures in the rock that help release the oil. 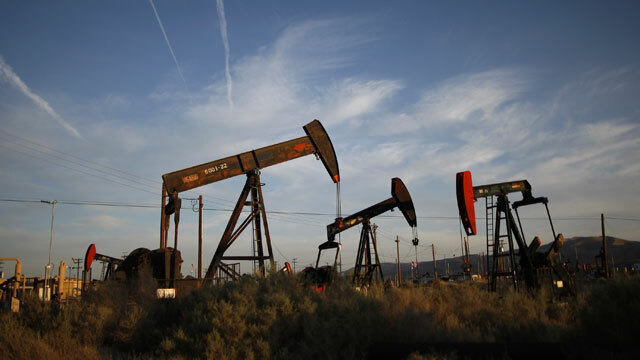 Historically, oil companies in California haven’t had to tap into the source rock. There were plenty of conventional reservoirs to develop. But as the technology has improved and production in older reservoirs has declined, oil producers have started looking deeper, down to the Monterey Shale source rock. Is the Oil Still There? North Dakota has seen a massive oil boom in the source rock of its Bakken formation, due in large part to hydraulic fracturing. Fracking opened up source rock that was considered beyond reach just a few decades ago. The question in the Monterey Shale is whether the source rock still holds lots of oil. California’s abundant seismic activity could have forced much of the oil to migrate out. Because of these unknowns, many believe there’s huge uncertainty about the amount of oil that can be recovered in the Monterey. USGS is working on its own estimate of recoverable oil in the Monterey, expected early next year. The seismically warped rock layers in California could also make it challenging to use the same fracking techniques that have been so effective in North Dakota. 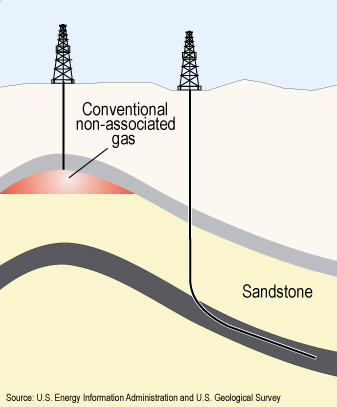 Oil wells are drilled horizontally for miles sometimes along a layer of rock. California’s roller-coaster rock layers could make horizontal drilling a challenge. Oil companies are still in the early stages of drilling exploratory wells in the source rock. Until more of that data are available, the jury is still out on the Monterey Shale. “The fact of the matter is there've only been a handful of wells that even intended to test the idea,” says Gautier. Despite the lackluster new estimate, the oil industry says the number has little effect on their efforts. “The oil is still there,” says Catherine Reheis-Boyd of the Western States Petroleum Association, an industry group. Several oil companies say their exploratory wells are getting them closer to the answer. A collation of environmental and community groups called Californians Against Fracking is using the new estimate to raise concerns over groundwater contamination and environmental damage. “This bombshell from the EIA gives you a new opportunity to make the right call and halt fracking,” they wrote in a letter to Governor Jerry Brown. The group, which is calling for a moratorium on fracking, says the lower estimate of the Monterey's potential means that economic benefits touted by the industry are inflated. Governor Brown has resisted a moratorium, citing the state’s efforts to develop regulations for fracking this year that require groundwater monitoring, new permitting requirements and notification of neighbors in the area.